As of March 2010, the waf build of Samba4 is now complete. We also have waf build rules for libreplace, talloc, tdb, tevent, ldb and Samba4. Kai is working on the waf build for Samba3. In waf, Makefile.in files have been replaced with wscript_build files. Edit these to add new files/dependencies instead of the Makefile.in files that autoconf uses. There are two ways to use the waf build. You can either use the configure wrappers, or you can call waf directly. You can also use ./configure.developer as usual. don't install waf on your system, instead use the one in buildtools/. This ensures we are all always using the same version. Try "waf --help" for help on using waf. Try "waf configure --help" for the equivalent of "./configure --help". I haven't added all of our Samba configuration options yet, but I've put in the most commonly used ones (such as --enable-developer). You may also find "waf -v" useful for seeing the build commands. Or use "waf -v clean build" to clean and build a tree, with the commands shown. Use "waf -p" to show a progress bar on the build. While will set you up for creating the binaries in devbuild instead of the default of bin/. With the waf based build we get a number of new features that we didn't have in the old build system. Will create tevent-0.9.8.tar.gz. If you unpack that tarball then you'll find it has automatically included the talloc and libreplace libraries in the distribution. It has also setup a autogen-waf.sh which will generate a working configure script and makefile. The command 'waf distcheck' is also useful. It will create a distribution tarball, then unpack it in a temporary directory, and configure, build and install it (in another temporary directory). It will then run 'waf uninstall' and check that no install files remain. One of the main challenges we had with the previous build system was how we built and used shared libraries. We had difficulty getting a system in place that worked well both for the package maintainers in distributions, and for people building Samba themselves. Perhaps the easiest way to explain the new system is by explaining each of the key configure options, and give common use cases. The --bundled-libraries option allows you to choose which libraries are 'bundled' with the build. A bundled library is a in-tree library which may have a system equivalent on some systems. The waf build process needs to decide for each library whether it will bundle it or not. If the configure process does decide to bundle a library, then it will automatically append a suffix onto the library name. The default suffix is the name of the package you are building. For example, if when building Samba4 you bundle the tdb library, then it will build a libtdb-samba4.so shared library. The reason for the renaming is that it allows the libraries to be installed safely. If we left the name as libtdb.so, then there would be no way (without rpath) to run the newly built tdb library for Samba, but leave the rest of the system using the system supplied tdb library. The default is to try to use system libraries if they are at least the same version as the in-tree version. This means that if we increase the version number of our in-tree copy of tdb, that we will prefer that in-tree copy as a bundled library until the system version catches up. The 'NONE' option is what many distribution packagers will choose. It tells waf not to bundle any libraries. That means that if the configure process can't find a suitable system library (of the right version) the configure will fail. The 'ALL' option means to bundle all libraries. That means any equivalent system libraries for our in-tree libraries are ignored. That means to bundle ldb, but to get all other libraries from the system. That means to bundle all libraries except tdb. In that case tdb comes from the system. That would tell configure to bundle all libraries except tevent. The problem with this is that tevent depends on talloc. So if we did used the above settings, then we would end up linking in talloc twice, once from the system libtevent.so, and once from the bundled libtalloc-samba4.so. The configure process detects this error, and gives an error. The --builtin-libraries configure option allows you to control what libraries are directly (statically) linked into the program, instead of being linked as shared libraries. For Samba4 the default is to build all libraries as shared libraries. The default for standalone builds of tdb, talloc, tevent and ldb are to build libreplace as a builtin, with the other dependent libraries built as shared libraries. that says that when building a standalone tevent, we should only use the system version of tevent if we also have the system version of talloc. would tell configure not to add a bundling extension when building talloc. By default the waf build will only use an installed system library if it is at least the same version as the in-tree library. This maximizes the chance that the library that is linked to will have been properly tested by the developers. It is recommended that you don't use this option without a very good reason, as if you use it you risk creating a build that doesn't incorporate necessary bugfixes from recent changes in the libraries. The 'rpath' facility of shared libraries and binaries is a way to control where the binary/library goes to look for its dependencies. It is like building a LD_LIBRARY_PATH directly into the binary/library. rpath is particularly useful for developers, as it allows the running of build binaries without mucking about with LD_LIBRARY_PATH. The default for the waf build is to use rpath both for the build and the install. This is the most useful option for people who build Samba themselves. That puts all object files, generated files and binaries in /tmp/tdbbuild. This works nicely for simple packages like tdb, but it gets trickier for full Samba builds. The current problem is with our testsuite, which has some hard-coded places where it assumes binaries in bin/. We also have a problem with the gen_ndr directory, which breaks the out of tree build of IDL files. In the future we should be able to support out of tree builds for Samba4, but not just yet. You can build for non-host architectures by using the cross-compilation features of the build. In either case you will need a cross-compiler setup installed. If you have an emulator setup to run cross-compiled binaries then you can use --cross-execute. This will allow you to accurately configure your build with the correct answers. For example, on a Debian derived system for an ARM target you would install gcc-4.3-arm-linux-gnu, linux-kernel-headers-arm-cross and qemu-arm-static. That will give you enough to create ARM binaries. that tells the build to use the arm-linux-gnu-gcc compiler, and to cross-execute the test binaries during the configure stage using the qemu-arm-static tool. By using a --cross-execute tool you can ensure that all your configure tests can run correctly, which avoids the problem of having to work out things like the size of various target architecture types. and it will run using qemu. If you don't have a emulator for your target machine, you will need to use the --cross-answers option. When you specify something like --cross-answers=target.txt the build will place unknown configure tests in target.txt. You then need to edit that file, and change any UNKNOWN answers with the correct answers for your target. The configure stopped at that point as it needs to know if a simple C program can run before it will continue. If you look in bin/config.log (or in bin/.conf_check_0/) you will see the source code for the program that it was testing. Note that only the tests that involve running an executable on the target have been added. The other tests are able to be completed by running on the host, and thus do not need a cross-answers entry. Checking size of char: "1"
Checking size of int: "4"
Checking size of long long: "8"
Checking size of long: "4"
Checking size of off_t: "8"
Checking size of short: "2"
Checking size of size_t: "4"
Checking size of ssize_t: "4"
Checking size of dev_t: "4"
Checking size of ino_t: "4"
Checking size of time_t: "4"
Checking size of void*: "4"
A library declaration that uses ABI checking gets two extra options, abi_file and abi_match. when the library is linked, the build system will check if the ABI signatures have changed. If they have, then it will suggest modifying the major version number if a symbol has been changed or removed, and the minor version number if a symbol has been added. The build will fail. if the ABI has changed and the build fails, then you should update the library version (the VERSION variable in the library wscript) and then re-run the build. That will regenerate the new signatures file. This should be committed to the git tree. if the ABI has changed for an existing ABI version (eg. change a symbol) and you are really sure you wish to overwrite the old ABI signatures, then you can build with the --abi-update option. That will cause the new ABI signatures to be written out to the ABI file for the existing ABI version. in that case you would need to edit VERSION in lib/talloc/wscript, then run "waf --abi-update" to regenerate the ABI signatures. in that case you would need to either mark talloc_is_parent2() as being _PRIVATE_, or you could edit VERSION in lib/talloc/wscript, then rebuild to regenerate the ABI signatures. this will place the ABI file in ABI/talloc-2.0.2.sigs for the 2.0.2 version of the library. A separate signatures file is generated for each library version. The abi_match option means that only symbols starting with talloc or _talloc will be considered as part of the ABI. The hide_symbols=True option tells the build to enable the -fvisibility=hidden compiler option (if supported) for building this library. That is used in combination with the _PUBLIC_ and _PRIVATE_ attributes on functions to ensure that symbols are not exposed in libraries when they shouldn't be. The eventual aim will be to enable symbol hiding in all of Samba, but we first need to ensure that all ABI symbols in libraries are marked as _PUBLIC_. The above options will disable use of rpath (for both build and install), and will force the use of all system libraries. That means you will first need to ensure that your system has up to date versions of all the dependent libraries, otherwise the configure will fail. You may also want to control the number of builtin libraries. See the section on builtin libraries above. Apart from that, packaging with a waf build is very similar to packaging with a autotools based system. You may also want to add JOBS=4 or similar to the make command to get build parallelism. The makefile based waf build defaults to one CPU. Each project within Samba (tdb, ldb, talloc etc) gets a wscript file. That file can depend on other project wscript files. I've kept the wscript files for each project simple by using a 'waf tool' called 'wafsamba', which is in buildtools/wafsamba. Wafsamba is an add-on for waf that sets up the waf configuration and build commands to follow the same sorts of conventions that we have in the existing Samba4 build system. If you want to have a look at how this was done, then look in buildtools/wafsamba/. You will notice that I've put a lot of paranoia checking in there, as I've found that the exiting config.mk files for the bulk of Samba4 contain some 'interesting' features, such as dependency loops and missing dependencies. The build rules I've added for Samba also need to be documented. I've started this process using pydoctor. One nice thing about the use of waf is we gain parallel builds. 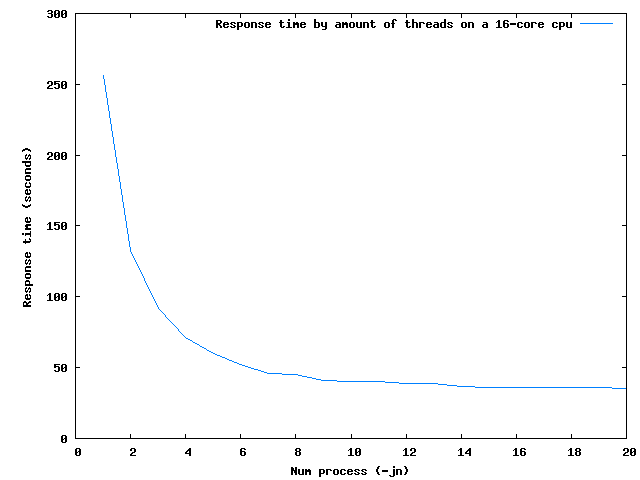 On a 16 CPU machine a complete clean Samba4 build takes just 35s, including rebuilding all of the IDL files. It takes over 5 minutes on the same machine with the old build system. A short list of work items, not complete! Waf should error out earlier if ./configure.developer is run without gdb available for the ABI scripts. We need rules to regenerate files with yapp (for pidl) if the grammar has changed. We need rules to regenerate files with yacc and lex (for heimdal), here we need to only allow trusted combinations of bison and flex. If the system has this tools we need to have rules for them, otherwise we need a way to give an error if the "source" has changed but we're not able to regenerate. The AIX, IRIX and TRU64 compilers can generate shared libs. We need to support that and test that it works correctly. for options like --enable-developer we need to check the compiler supports the various options. The flags should only be used in the build and not within configure checks. We need to call the same install scripts we used from the old build, at least initially. We need to have a replacement for the old 'make gdbtest' and 'make gdbtest-env'. The uuid module in scripting/python should only be built if the python version in use is <= 2.4. Newer versions of Python include this module. When preparing releases make sure ABI/API are checked for breakage so that it can be handled appropriately by either fixing the code or eventually increasing the .so version for libraries marked stable. We need to detect configure related changes to wscripts and give an error at build stage. it is not yet possible to use the system-installed heimdal when using the waf build, it will always use the internal heimdal at the moment. there is some work work in progress in heimdal_build/wscript_configure to support this. .so files created for modules do not contain any symbols, making them unusable. This page was last modified on 3 January 2014, at 14:59. This page has been accessed 49,004 times.